After the 6th April attack on Gurdwara Sis Ganj Sahib, Sikhs warn RSS and Hindutva India against conducting another attack on the Sikh Nation, Gurdwaras, or Sikh religion. Do not think this is 1984, that you will be able to get away with killing Sikhs, attacking Gurdwaras, and disrespecting Sikhi. If any attack should occur, Sikhs will respond in force and will destroy all RSS. New Delhi: The Delhi Sikh Gurdwara Management Committee (DSGMC) has issued an alert urging the Sikh Sangat to remain vigilant as a Delhi court has reportedly re-ordered demolition of Bhai Mati Dass Ji Chhabil (Piao) near Gurdwara Sisganj Sahib in Chandni Chow area of Delhi. Saad Sangat ji Please be informed that today Court has reordered to demolish the Piao at G Sis Ganj Sahib that was resurrected with help of Sangat after demolition. We appeal to Sangat to be alert and vigil so that further no damage comes to the Shaheedi Sthan of Dhan Guru Tegh Bahadur Sahib. Please be at guard for any untoward incident. 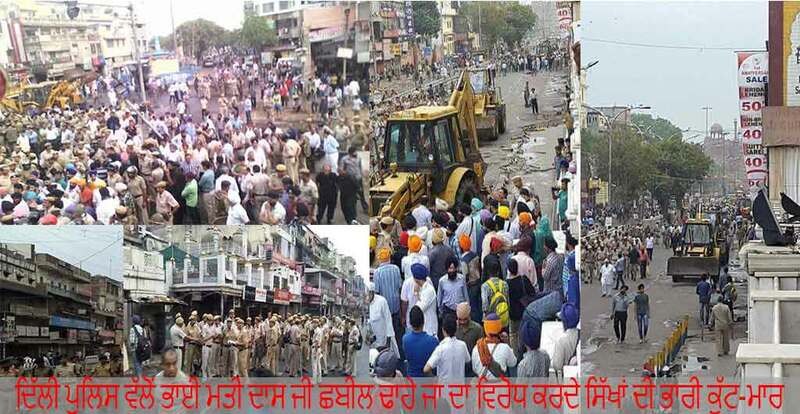 The Chhabil was demolished by M. C. D. with the help of Delhi police on Wednesday (April 6) but it was rebuilt by the Sikh sangat with in few hours.